♬ Early Education-Do you hear that? Baby will discover three kinds of sounds for musical instrument, songs and animal sounds by pressing the center button. 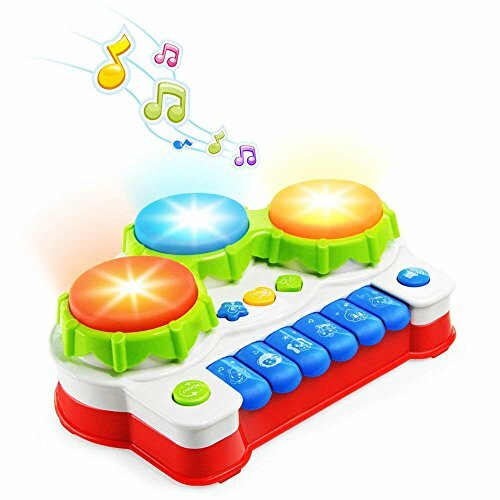 NextX Baby Musical Toy with 6 piano keyboards, 3 hand drums and 3 musical instrument buttons, a creativity toy for baby to hear and learn different fun sounds. ♬ Preschool Learning Toy- Wow, look at those lights go! Can baby dance to the music, too? Baby can work out emotions by hitting on a drum or creating a tune on a toy piano. For more structured play, they can follow the lights on the drums as they hear about fun sound. And also can help develop the baby's hand-eye coordination, and finger flexibility! ♬ Unique Design-Lovely shape with cute button design that attracts your budding musician curiosity and helps the baby easier to recognize patterns, animals and colors. A button with three modes for adjusting the volume to protect your baby's hearing. ♬ High Quality & Safe-Made from high quality ABS plastic, nontoxic, environmental friendly to baby. Round edge design protects your baby little hands. Carry easily for your baby or kids to enjoy the music whenever and wherever they like. ♬ Satisfaction Guarantee-The best preschool toys and Christmases' gift for your baby one year old and older. We provide 30 day no questions asked return policy and free returns if you are not satisfied with it.